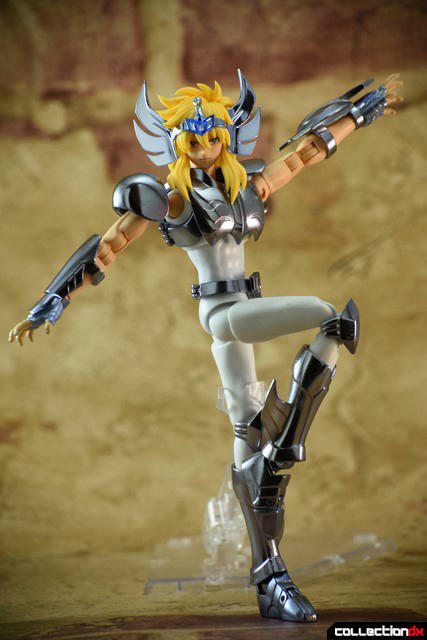 Cygnus Hyoga is one of the five main Bronze Saints in Saint Seiya. 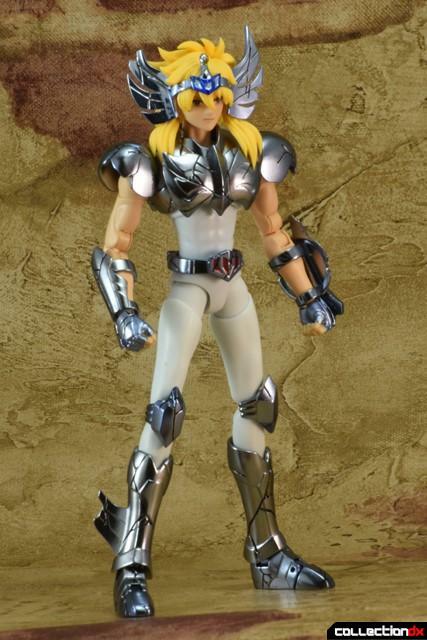 Hyoga is a calm and collected warrior of Russian and Japanese decent. In Japanese his names means glacier, which is a fitting name for a fighter that uses his cosmos to unleash freezing attacks on his enemies. 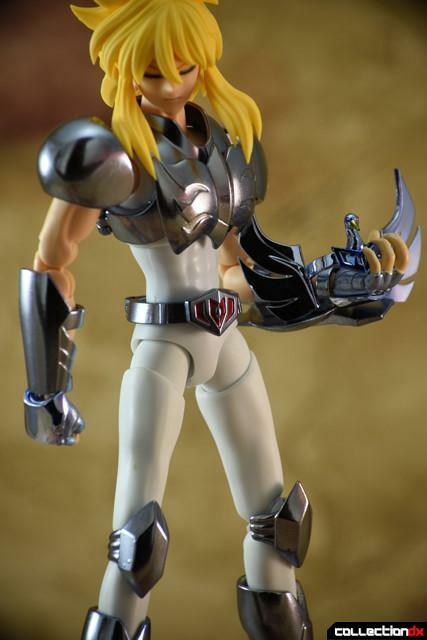 In order to learn this specialized form of fighting, Hyoga had to travel to Siberia where he was taught by Aquarius Camus (or Crystal Saint in the anime.) 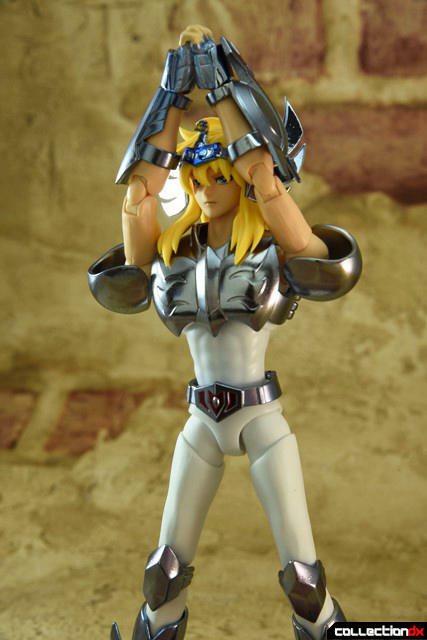 In order to prove his worthiness of the Cygnus Cloth, Hyoga has to break a glacier that had held the Cygnus Cloth it its icy grasp for many centuries. The box is the usual EX fare. A box made to look like the Saint’s Pandora Box and a sleeve to go over the box. 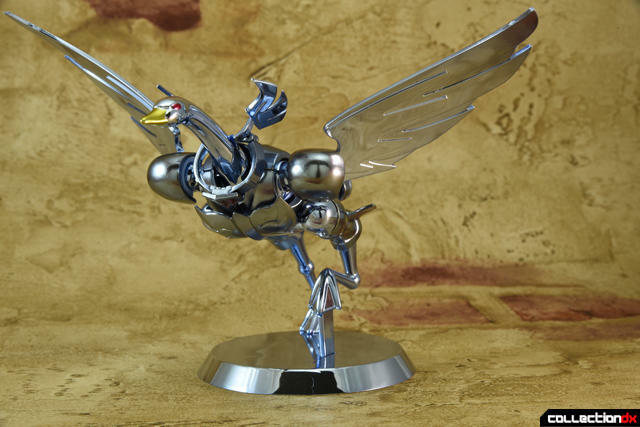 Hyoga’s Cloth represents the Cygnus constellation and takes the form of a swan in its Object Mode. 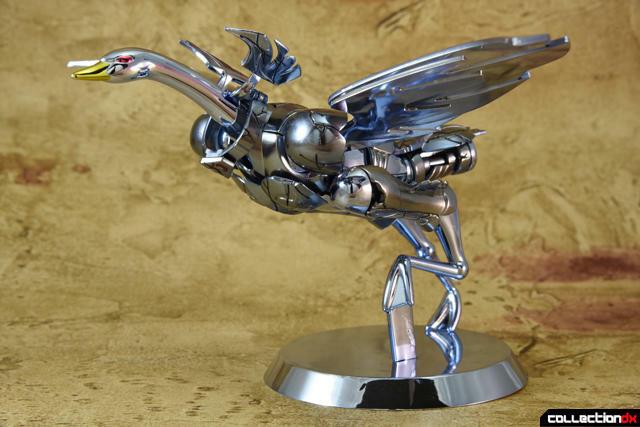 Cygnus being the Latin word for swan. The EX Version of the V2 Cygnus Cloth looks great and is pretty easy to put together. 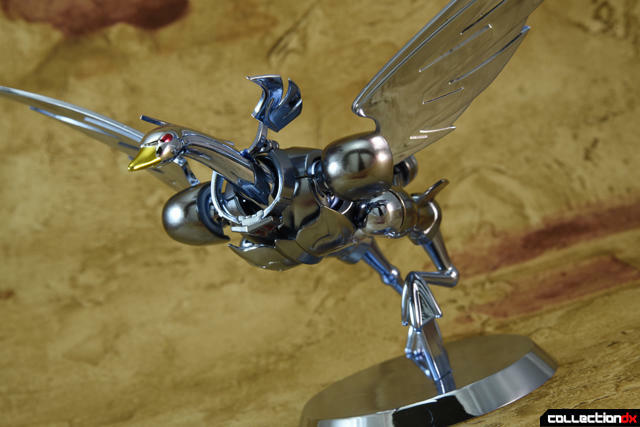 I couldn’t find any pictures of what the V2 Cygnus Cloth Object Mode looks like in anime, so I can’t really speak to how accurate the EX Object Mode compares to its anime counterpart. However, since the EX Line has had a pretty good track record of having Object Modes that are faithful to the source material, I would assume that the same is true for the Cygnus Object Mode. 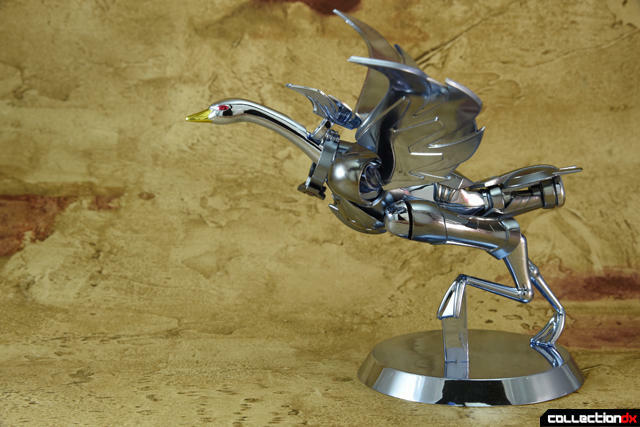 The swan even has different colored eyes, which is an awesome little detail that Bandai made sure to capture. 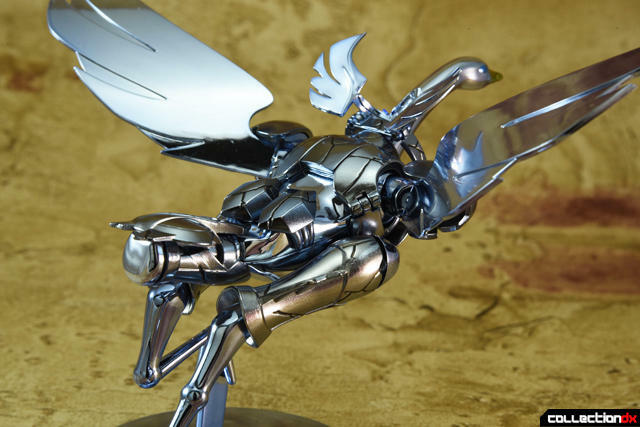 A key part in EX Bronze Saints releases is the inclusion of an extra set of armor, which is damaged. This second set of armor also can be displayed as a broken Object Mode. From some angles, and especially if you are not close to the toy, it is s a little bit harder to notice the cracks and chips in the armor. 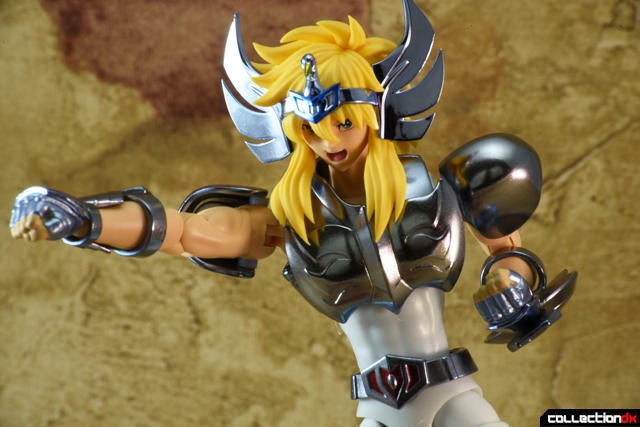 During the Battle of the 12 Houses, Hyoga’s Cloth is badly damaged and is subsequently repaired using the blood of the Gold Saints. 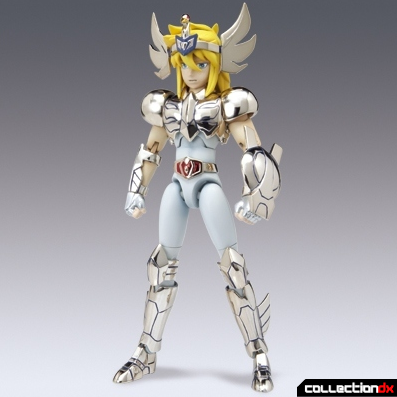 The version 2 armor is the one that Hyoga uses during the fight with the God of the sea, Poseidon, and his Sea Generals. 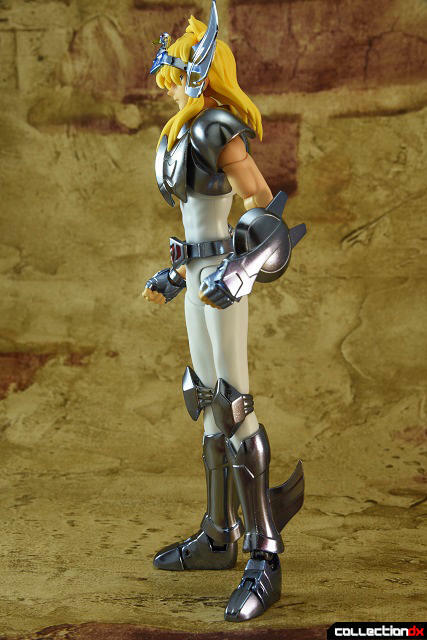 This release, like the other EX Bronze Saints, contains the Version 2 armor. 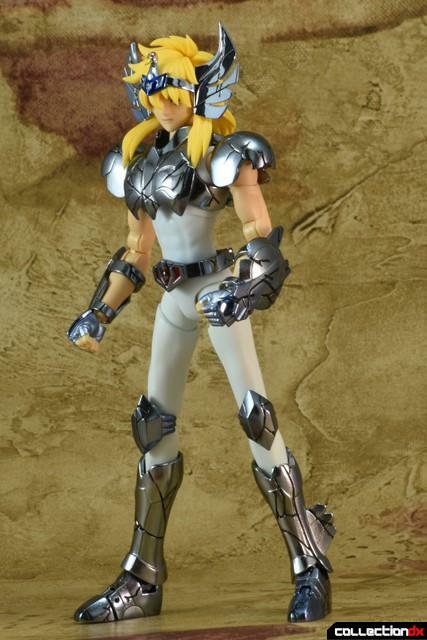 In full armor, the otherwise anorexic Hyoga looks pretty darn good. The face and sculpts are really nice. 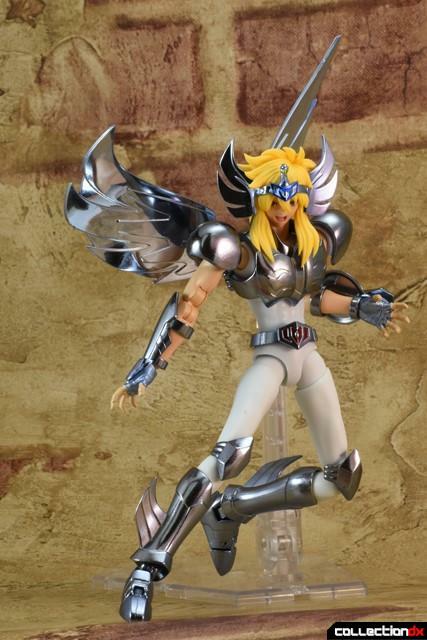 I think Hyoga has the best face sculpt of the EX Bronze saints. It is worth noting that the front side hair uses the same peg system as Mermaid Thetis, rather than having the front part of the hair being one solid piece. This is great because I truly hate it when the front hair and the chest armor clash, and end up limiting the movement of the head. This is the part of the review where I normally post a side-by-side comparison of the EX version and the original release. However, I lost the latter a few years back when I was moving my toys around. 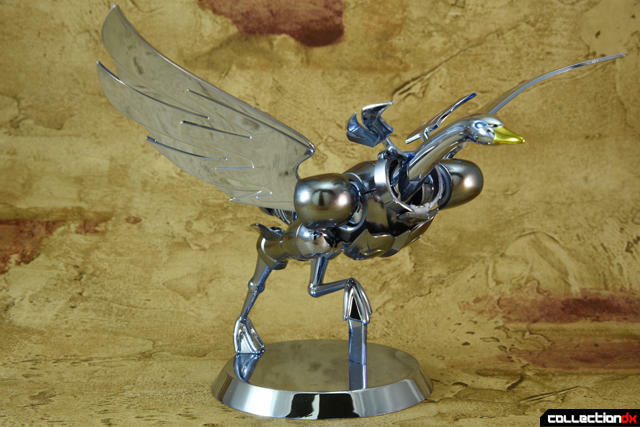 So here is a stock photo of the original SCM Cygnus Hyoga. I think we can all agree that the proportions and look of the EX are much more spot on than the original release. 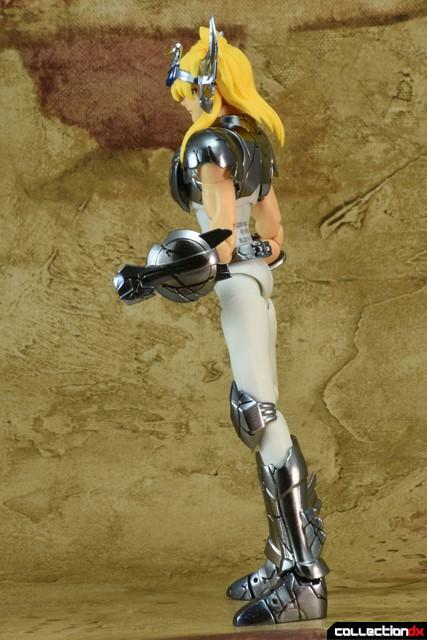 Hyoga also looks good in his broken Cloth. 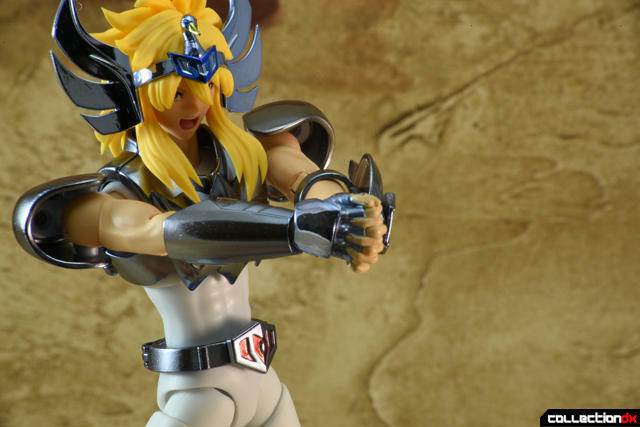 With the armor on the Hyoga’s body, it is much easier to admire the cracks and asymmetrical breaks in the cloth. 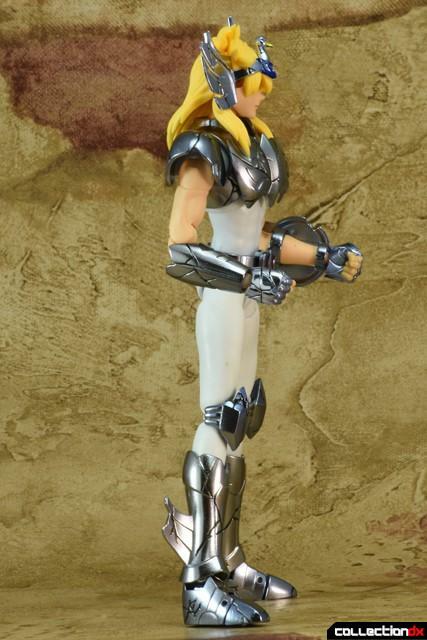 As for articulation, the EX Hyoga sports a Saint Cloth Myth EX body. 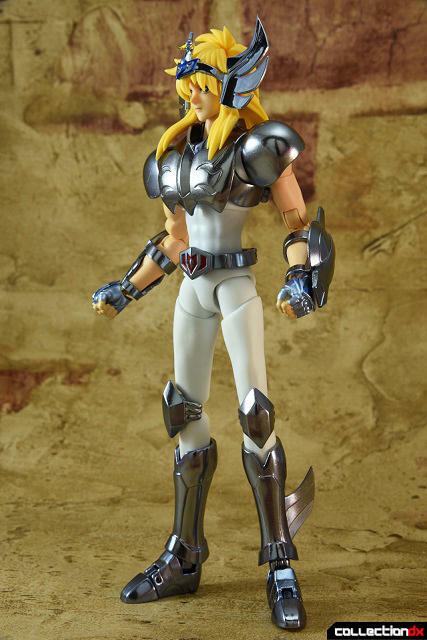 Since Hyoga’s armor is minimal, it can move pretty much unrestricted when he is fully armored. Thanks to the awesome articulation of this toy, you can also get some pretty dramatic poses out of the battle-damaged saint. 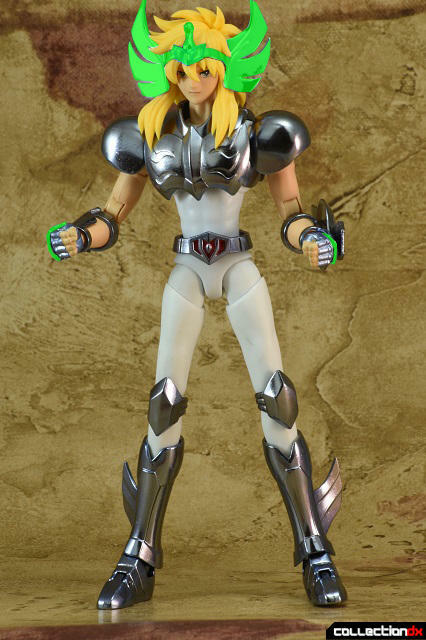 Hyoga comes with four faceplates in total. It is pretty much the standard fare for the line, except for the faceplate that has one eye closed. 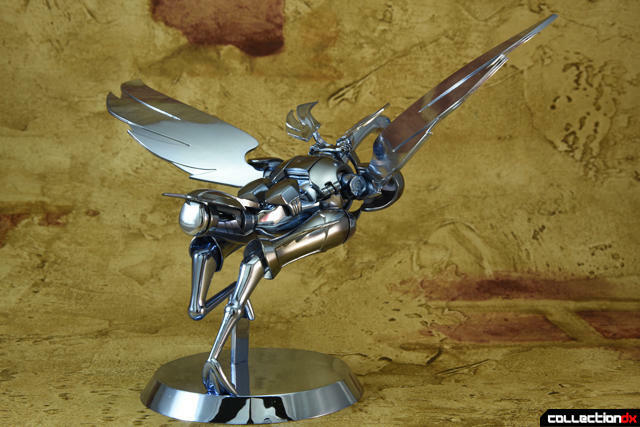 This is to represent when Hyoga loses his left eye. However, it sometimes makes him look like he is winking rather than closing his eyelids on account of the absence of his eye. 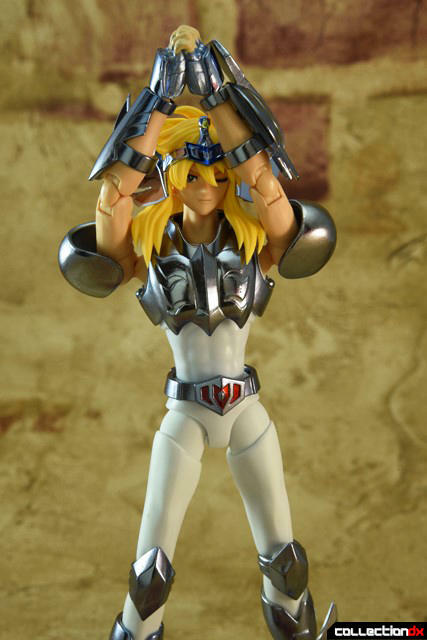 Hyoga also comes with 7 sets of hands, to pull of all the attacks that I have already demonstrated in this review. 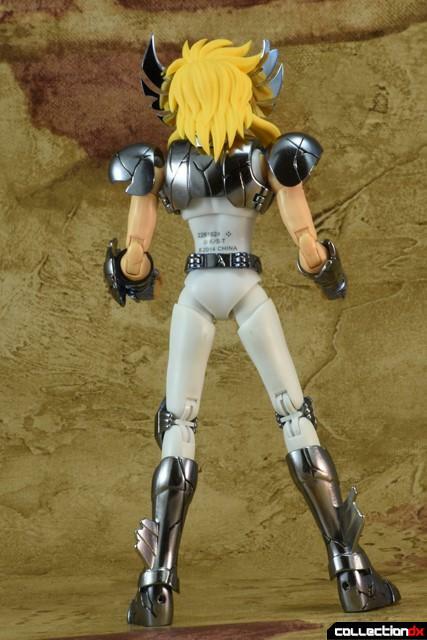 Finally, Hyoga also comes with a secondary plate for the back of his upper body armor. 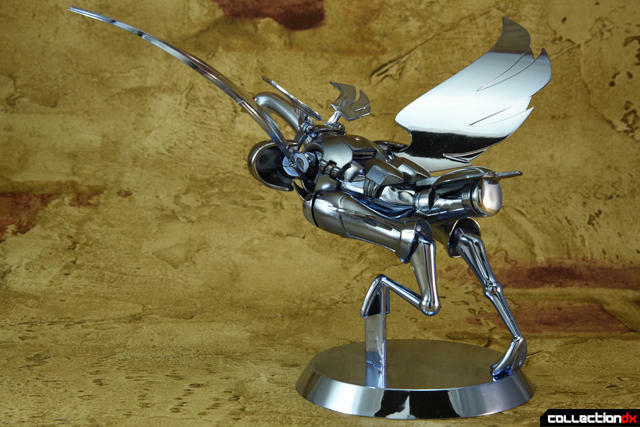 You can attach the wings of the Object Mode onto the plate. 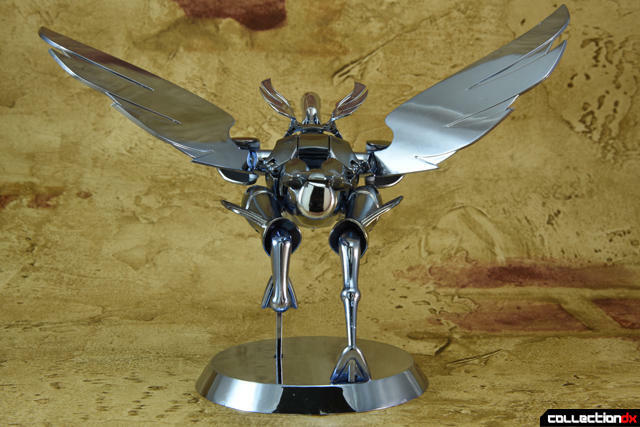 The sockets of the plate are on hinges, so you can move the wings laterally. 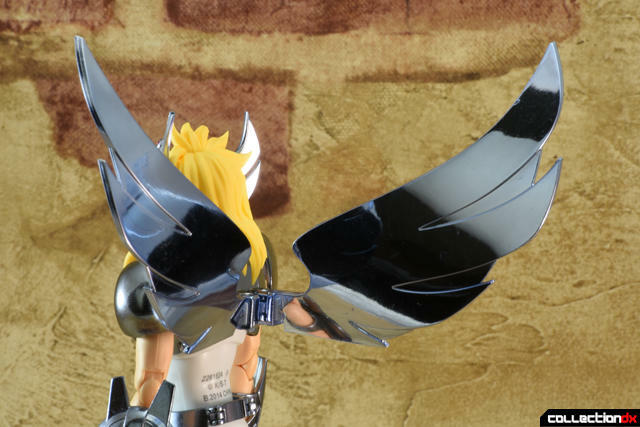 While this Cloth does not make a winged appearance in the series, you can have fun posing Hyoga with his non-canon wings. Use of plastic for the armor is kept to a minimum. Only the headpiece and the covers for the backs of the hands are made of plastic. 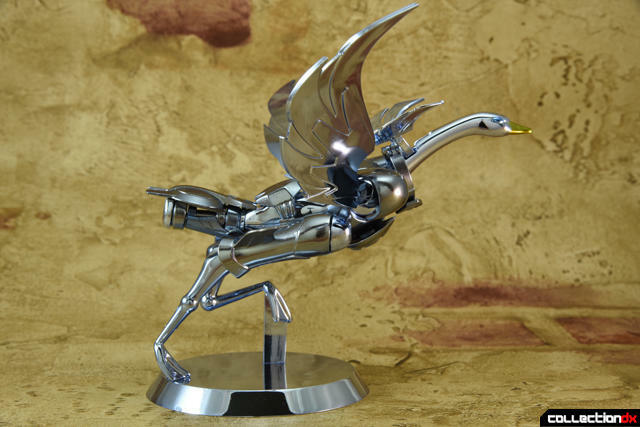 The rest of the armor is made of diecast metal! 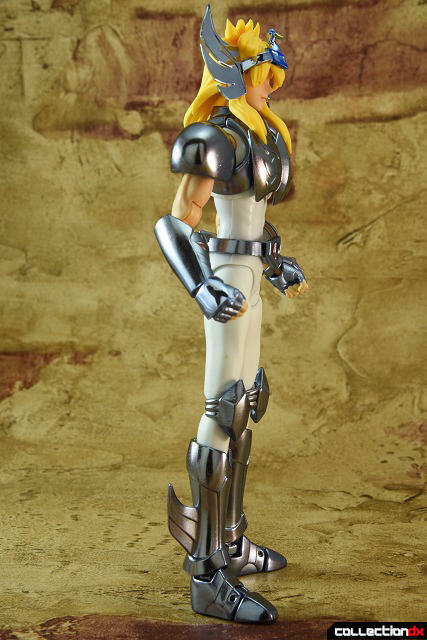 So this is without a doubt the best looking and most poseable V2 Cygnus Hyoga there is on the market. Some may be turned off by EX version skinnier build. 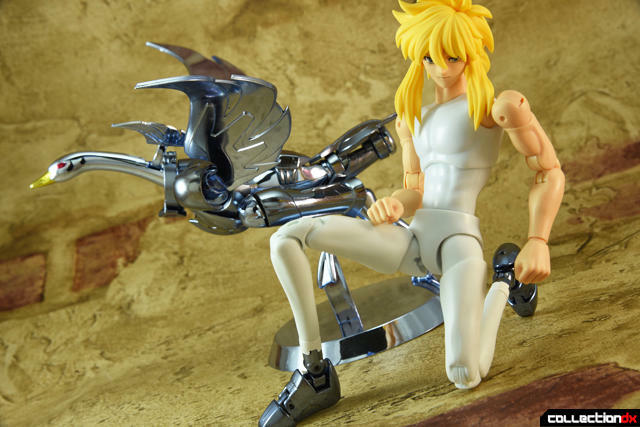 However, I have learned to overlook the lean physique of the EX Saints, as it does make for the most dynamic action figures with removable armor from the Saint Seiya universe. With this, I have completed the EX Bronze Saints and the completion of the EX Gold Saints is just around the corner. I cannot wait to be done with this long journey of getting the updated version of some of the earliest releases in the SCM line. 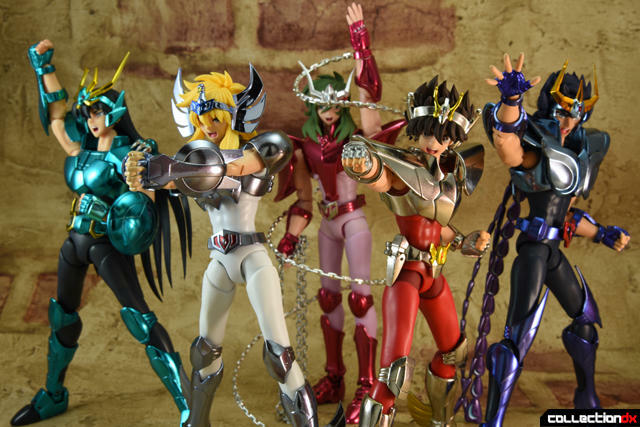 They all look good, but I find it rather lame they don't come with heads and masks that can fit on the Gold Saint bodies. True. That was a missed opportunity. 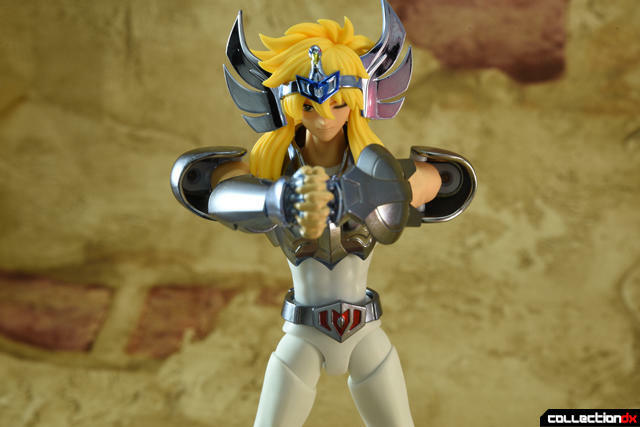 As much as Bandai has touted that the EX releases were to be THE ultimate versions of the Saint Seiya characters, they have dropped the ball on several things with each character and with the line as a whole. Perhaps they are holding back in case they make renewal versions of the EX releases. I don't think my wallet can handle that many duplicates Saints though. I've not even bothered to pick up any of the EX figures, it's just Bandai's attempt at sucking the last bit of money they can from the franchise. 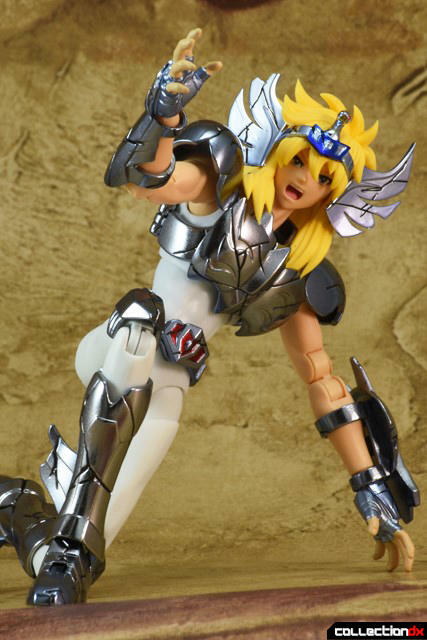 I doubt I will even bother to pick up the Leo God Cloth from the new anime, since it will be EX and likely very expensive. I feel ya. They know that the Gold Saints sell, so it seems like they made a new series around them to sell more merch. 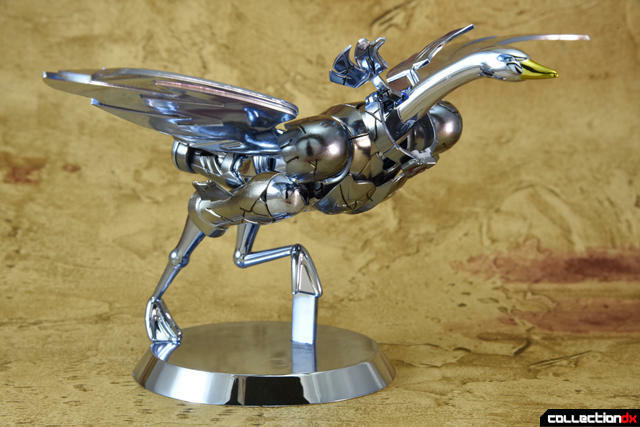 Nice to see another nice brand-new review. 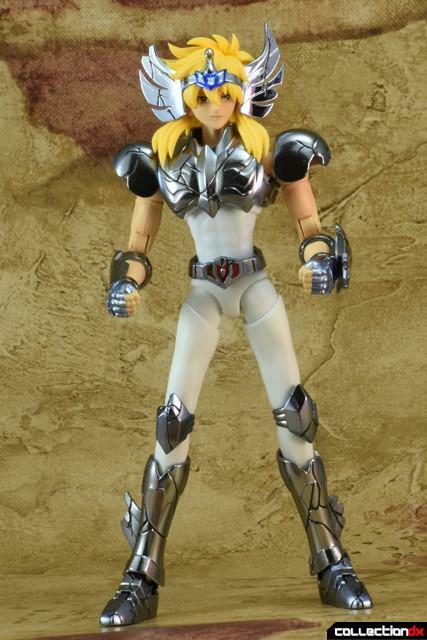 Hyoga is awesome in this release, as expected. However, I'm amazed to see that the old SCM release is still pretty damn good nowadays. The first SCM Ikki, for example, looks very rough today, especially because of his enormous head. I don't know why they could not include blood on his winking face, since blood is in fact there at every moment he shows up before he uses a bandage (except for when his eye appears magically healed in the last Poseidon arc episode). It really looks more like a wink, a serious strange wink, but still a wink. By the way, they could have included a bandaged face, since it would perfectly fit on his broken armor. Since someone mentioned something about, I remember I read so long time ago that the Bronze Saints' bodies from the first SCM releases fitted their respective occasional Gold Clothes. 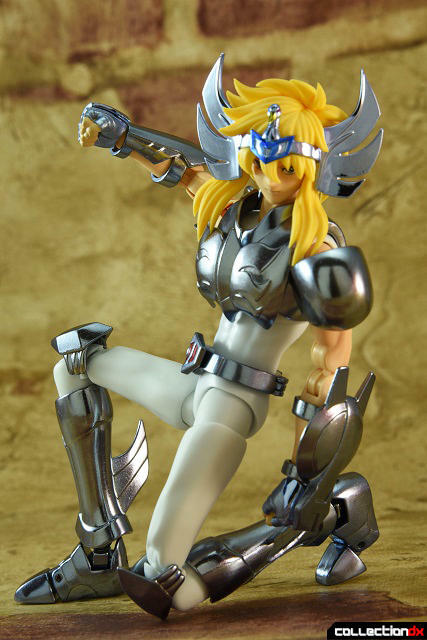 Hyoga's body, for example, could fit Camus' Aquarius Cloth from the SCM Camus release. Is it true or I've totally messed it up? If so, the EX Bronze and Gold Saints are not like that? Yes, and I know for a fact that Libra Dohko, Virgo Shaka and Sagittarius Aiolos included heads of the Bronze Saints. 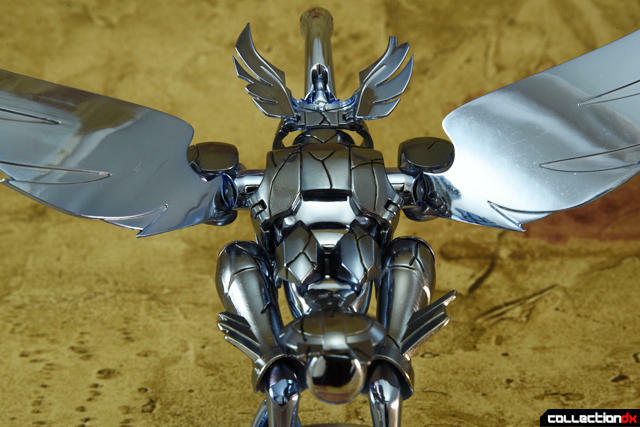 I think Leo and Aquarius included those as well, and I think most of the V3 Bronzes included face masks/helmets for their Gold armors, so you could have the more detailed faces on the bodies as well. The major problem with using the V3 Bronze Saint heads on the V2 bodies is that the ball joint on the necks of the V2s are a different size than the ball joints on the neck of the V3s. Also, the necks for the V2 Bronze Saints are shorter than the necks on the subsequent body types. 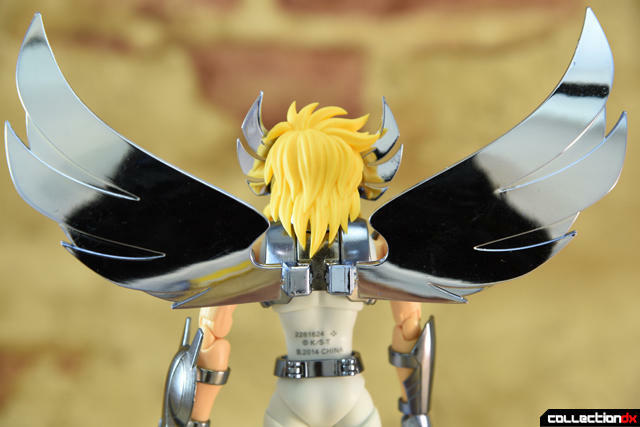 Bandai did release necks for attaching the V3 Bronze Saint heads to the V2 necks with the Bronze Saint New Born Boxed set of the V2 Saints... only problem is that Bandai decided not to include any ball joints for the top of the neck. So you end up with a neck that has a female end at the top and a head that has a female end at the bottom. So Bandai makes you work if you want to use those new necks. Luckily a couple of the Saints come with spare necks that you can steal the ball joints from. I think it is Krysaor Chryshna and Kraken Isaac that come with extra necks. 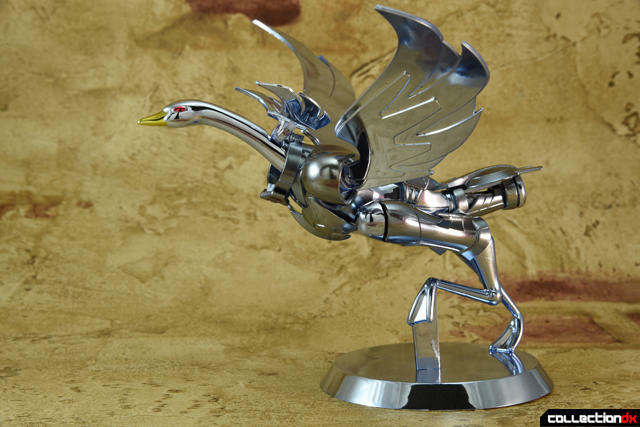 I have also heard that some people have fashioned ball joints for the necks out of jacks. I was going to try that at some point, as I have spares of a few Bronze Saints and their corresponding Gold Saint upgrades. I just have not gotten around to it. 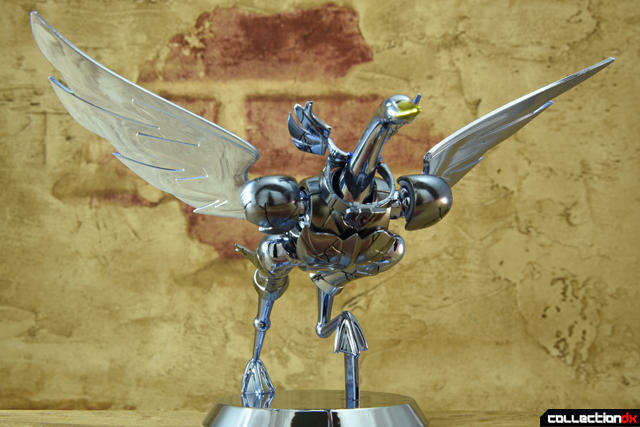 I still have some of my Myth Cloth figures boxes up and waiting to be unpacked. Thanks for the response. So just to be sure, does that yes mean "yes, it's true that Bronze Saints' bodies fit their respective Gold Cloths both in Cloth Myth and Cloth Myth EX lines"?